I had written a post over the summer after I had returned from my ADE 2013 experience where I spoke about the reasons I loved using this new platform — I spoke of the fact that it is free, the video notes, the ability to have smooth workflow with the placement of apps within the course — and the extension of the learning beyond the classroom walls. 1- Insertion of Augmented Reality into the course. I have been on this Augmented Reality kick and the kids really dig it. I make a trigger image in LAYAR and then I make the 2D image link to a 3D image. The picture becomes a video of my explaining the learning tasks to my students. It makes for a great think pair share when one student gets the trigger image in my iTunes U course and the other student scans it with the LAYAR app on their own device. 2- Ability to insert student work student work into the course – last week we made serial killer trading cards in the Trading Cards — an idea that I got from my ADE science buddy Julie WIllcott. This week we are going to insert those trading trading cards into an Explain Everything screencast where the students provide voiceover — then we will put the finished student product back into the course for the world to see. My students work smarter and harder when they know that their final product will be seen by the world. 3- Ability to APP-Smash- Hmmm what did I just mention in reason number 2? My students are using Explain Everything + Trading Cards + iTunes U. The Ben Bloom fist in the SAMR Glove is clutching onto this well-orchestrated APP smash that targets higher level learning outcomes for students via authentic project based learning. 4- Ability to Reach Adults and Children- I presented iTunes U to my Board of Ed and they were like kids in a candy store. Today I am creating two new courses — one for my physics class and one for a year long professional development class that I am teaching adults called Infusion of the iPad into Instruction and Curriculum. It is a great platform to reach students who are small and students who are tall. 5- Connection to the Big Ideas & Essential Questions- When I was getting my first Master’s Degree five years ago I embraced the work of Wiggins and McTighe. 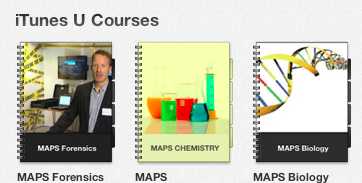 Understanding by Design is a successful methodology that is supported by the iTunes U format. ITunes U is organized in a way that it is easy for my to constantly be making connections to my big ideas, essential questions, and enduring understandings. I have 2 more courses on the way — stay tuned! !